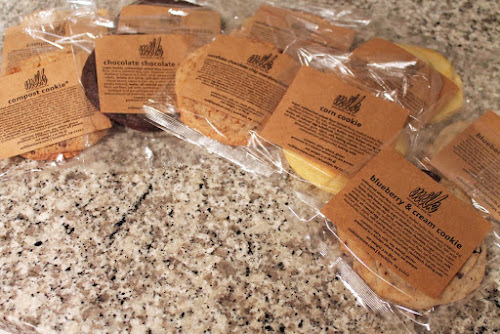 When we visited Momofuku CCDC for dinner recently, we left the restaurant with a rather large bag full of assorted cookies from Milk Bar, the restaurant's attached bakery. Since opening about a month ago, the bakery has maintained a rather long line of devoted sugaristas seeking cookies, soft-serve and crack (pie, that is). Momofuku Milk Bar's five varieties of cookies. 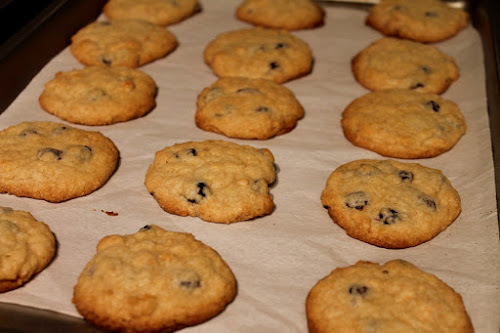 Note that the commercial version of Blueberry & Cream Cookies contains brown rice syrup and all-natural egg substitute. I'm not one for long lines, so it's nice that if you're eating in Momofuku CCDC, you can order as much as you want from Milk Bar and take it to-go. So we sprang for two of each of the bakery's five varieties of cookies: the corn cookies and compost cookies that we already knew and love, chocolate-chocolate (as chocolatey as you'd expect), cornflake-marshmallow-chocolate-chip (a chocolate chip cookie with added crunch and goo), and--what turned out to be real revelation--blueberry and cream cookies. In the Momofuku Milk Bar cookbook, Momofuku pastry chef Christina Tosi explains that the cookie came about as a showcase for milk-crumb, a buttery baked crumble of flour, sugar and powdered milk (Tosi calls it "milk powder") coated with white chocolate. Tosi says she doesn't drink milk straight--surprising for someone who's made a name for herself from a brand called "Milk Bar"--but said the crumb was inspired by her idea of what the flavor of milk should be. From there, Tosi thought of using the crumb in a cookie with a fruit flavor. Peaches were considered ("momofuku" is Japanese for "lucky peach"--not coincidentally the name of the restaurant brand's magazine), but in the end, she went with dried blueberries, which she found at Whole Foods (as did I, in size that conveniently is twice the amount Tosi's recipe calls for--perfect for making a double-batch as I did below). So this is basically a sugar cookie with the aforementioned milk-crumb and dried blueberries mixed in. Be sure to give yourself plenty of time to make this. The milk-crumb needs to be baked and cooled, and the dough needs to chill for at least 1 hour. I promise you'll be happy with the results, which are buttery, creamy, fruity and sweet. Notes: I have doubled the ingredients for the cookies to make a double-batch. The amount of ingredients for the milk-crumb is the same as in the cookbook. Tosi's original cookie recipe calls for using a 1/2 recipe of milk-crumb. Tosi smartly includes weight (in grams) and volume measurements for her cookies. I used the weight measurements for dry ingredients measured by the cup or cup-portion (but I've included her volumetric conversions for those measurements below) and volume measurements for liquid ingredients and ingredients measured by teaspoon. Tosi's recipe calls for glucose instead of corn-syrup, but she notes that corn-syrup in half the amount of glucose may be substituted. 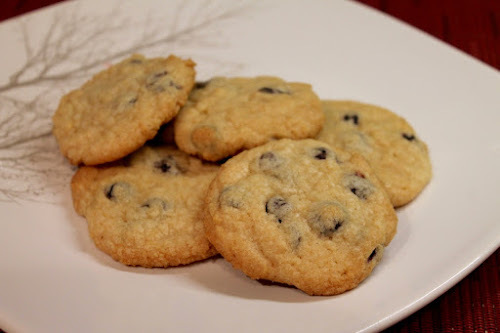 Her recipe also calls for white chocolate, but I used white-chocolate chips, as the bar variety was not available at Giant or Whole Foods the day I baked the cookies. 1. Preheat the oven to 250 F.
2. In a medium bowl, whisk together the first 40g (1/2 cup) of powdered milk, flour, cornstarch, sugar and salt. Add the melted butter and toss with a spatula until the mixture comes together in small clusters. 3. Spread the crumbs on a baking sheet lined with a silicon baking mat or parchment. Bake for 20 minutes until the crumbs are fragrant and look "sandy." Remove the crumbs from the oven and allow them to cool. 4. 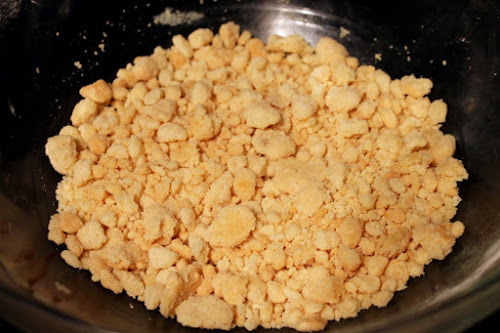 Transfer the crumbs to a medium bowl and break up any clusters larger than about 1/2 inch. Add the remaining 20g (1/4) of powdered milk and toss to distribute it evenly. Melt the white chocolate (I did this in the microwave using the package directions) and pour it over the crumb mixture. Toss the clusters with a spatula to coat with white chocolate. Allow the white chocolate to cool (takes about 15-20 minutes), tossing the clusters every 5 minutes. 1. In the bowl of a stand mixer, combine the butter, sugar, brown sugar and corn syrup and beat on medium-high until creamy, about 2-3 minutes. Scrape down the sides of the bowl with a spatula, add the eggs and beat on medium-high for another 7-8 minutes (I recommend scraping down the sides of the bowl every so often while doing this). 2. Whisk together the flour, baking powder, baking soda and salt in a medium bowl. Add the butter mixture and combine at low speed until the dough just comes together, no longer than a minute. Add the baked milk crumbs and dried blueberries and blend on low-speed until incorporated, about 30 seconds. 3. Portion the dough onto sheet pans lined with silicon baking mats or parchment (you'll need at least 4 standard-size baking sheets) in balls about the size of golf balls, 2-3 inches apart. Flatten the tops slightly. Wrap the sheet pans with plastic wrap and refrigerate for at least 1 hour, up to 1 week. 4. Preheat oven to 350 F with two racks evenly spaced apart. 5. Remove and discard the plastic wrap. Bake for 16-18 minutes, rotating the cookies top-to-bottom and front-to-back after the first 8 minutes (note: this is a little shorter than Tosi's original baking time, but I also made the cookies a little smaller). 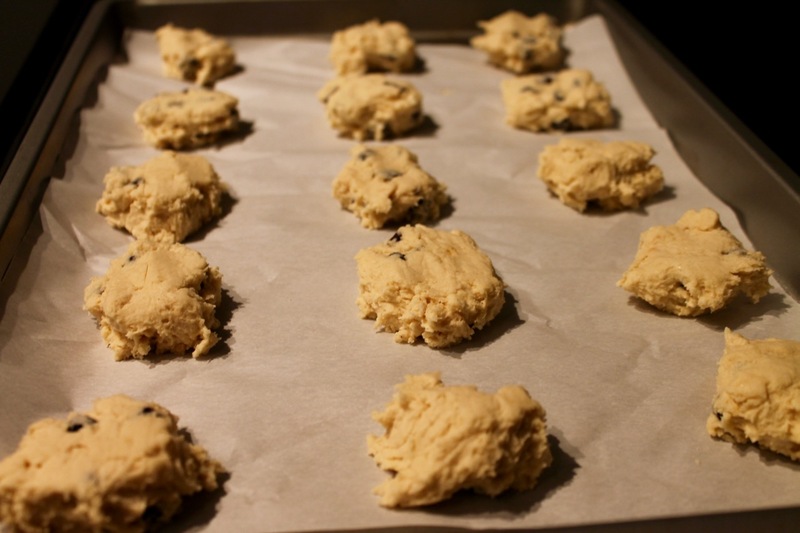 The cookies should be lightly browned on the edges and light yellow in the middle--continue baking another 1-2 minutes until they reach this point. Cool the cookies completely on the baking sheets, then transfer to an air-tight storage container.